Wow, have been very delinquent about updating my blog! I guess that's what happens when a new baby is on the way. Sorry folks, had to focus on wrapping up mostly corporate contracts to make sure we had a bit of a nest egg saved up before baby arrived. Don't have the luxury of EI for this mat leave, what with the whole freelancing life! 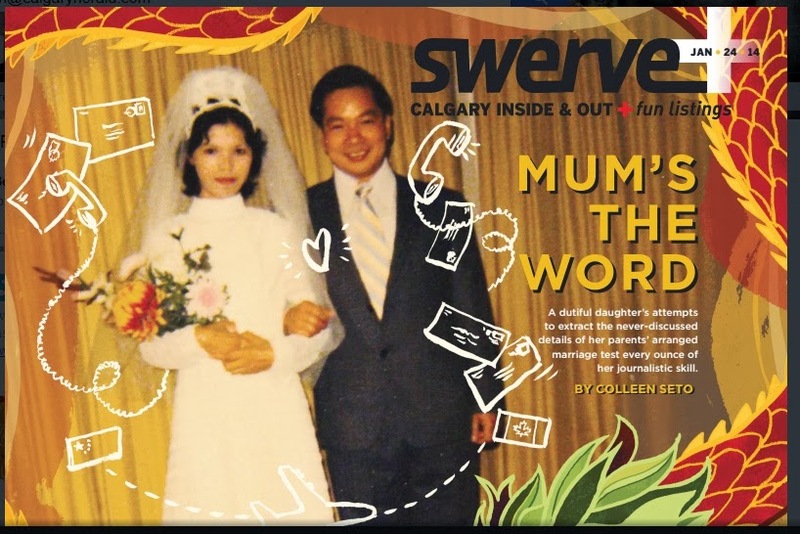 I did make time to write my first cover feature story for Swerve. It's about my search for answers into my family history, a story I've wanted to write for a long time. In this piece, I focus on my mom and her journey across continents, uncovering family details I never knew before. It was a learning process for all of us; difficult to research and write as is the case for most really personal narratives, but rewarding in the end. I'm glad I got to write it, and even happier that Swerve gave me a forum to showcase the work. The feedback I've received has been overwhelming; strangers have messaged me to say that they wish they had probed deeper to find out more family history before their parents passed away while longtime friends have revealed things like they were shocked when they discovered I was first-generation Canadian. One friend's wife who is also Chinese wrote me a page-long message telling me how similar her family story is, and how it was so amazing for her to see it mirrored in my story. She says it's rare for her to find stories that really resonate with her. Plus, my parents were quite proud, which was really important to me, of course. It's so gratifying to know when your stuff is not only being read, but touching people in some way.